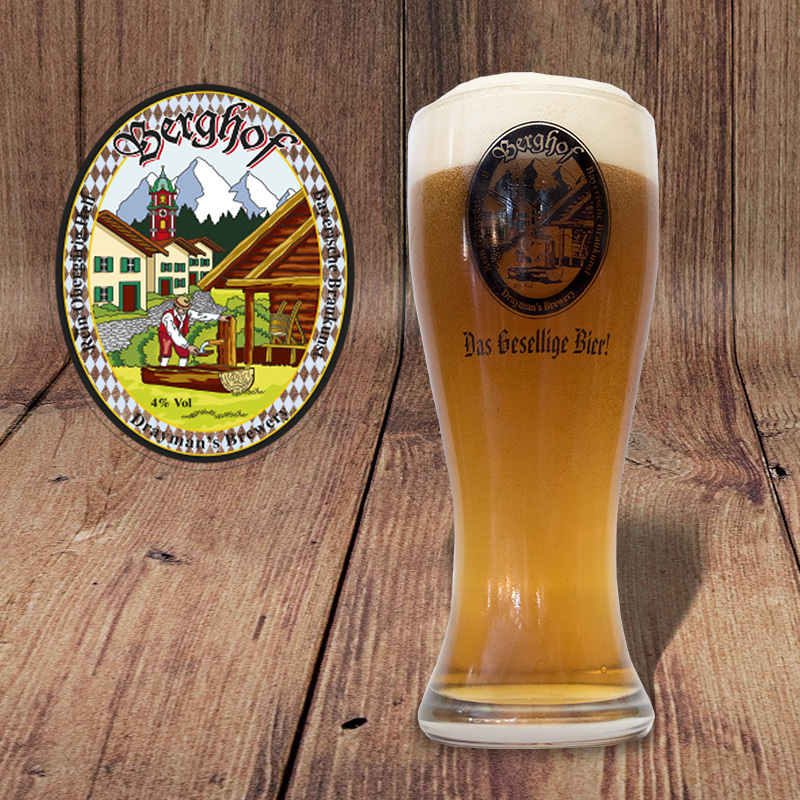 Berghof is as pale as a Pilsner but with the delicate fruitiness of an ale. Berghof is light gold in colour and clean tasting with a maltiness that is unmistakably German. A unique yeast strain imparts the flavourfull character and the light body is created by the use of a dash of winter wheatmalt. While the big-selling Pilseners in Germany are becoming blander, full-flavoured counterparts from Craft Breweries are increasingly being sought after. The smallest, the old established brewpubs of rural Bavaria, Bamberg and Franconia are a delight. Monks already brewed here in Klosterbräu Bamberg since it was founded in 1533. Its beers have great character and complexity. I think all Bavarian beer was like this when brewing was wholly an art and not only a science. Many German brewpubs specialize in beers such as unfiltered Keller or Zwickelbier and also a style identified as Obergärig Hell with its origins in the pre-lager era. A good example is Pinkus Müller Alt – in this instance Alt indicates simply an old style beer which is top fermented without suggesting anything in the lines of the Düsseldorf classics. Beers elsewhere with similarities would be English cask Pale Ale, certain Belgian Ales and of course the beerstyle unique to Köln, just across the border from Bavaria, Kölschbier. Most breweries have their own special tavern known as Ausschank where you can enjoy their beers fresh on tap. Berghof is as pale as a Pilsner but with the delicate fruitiness of an ale. Berghof is light gold in colour and clean tasting with a maltiness that is unmistakably German. A unique yeast strain imparts the flavourfull character and the light body is created by the use of a dash of winter wheatmalt. I follow the traditional Bayerische Braukunst involving a full programmed mash with protein-rest, conversion-rest, mashout and “vorlauf” for clarity. Single vat fermentation is employed (like a single cask Scotch Whisky) and no final blending with carbonated water is allowed at Drayman’s Brewery. Other more modern and scientific brewing techniques like cold pitching of yeast, coldbreak removal and chill filtration to ensure premium quality in the trade are also employed. 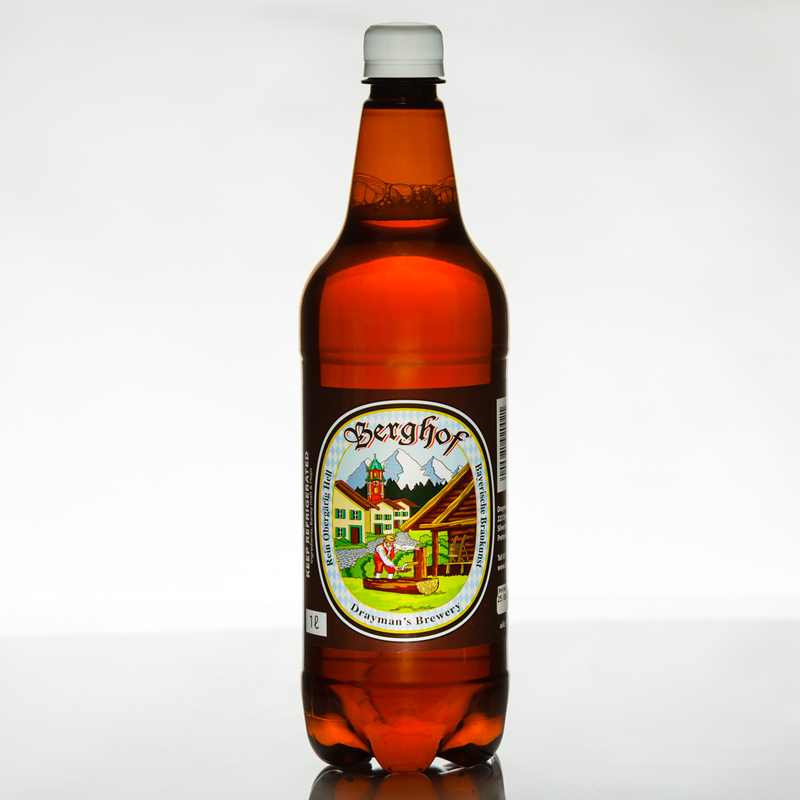 Berghof is only available as fresh, unpasteurized “tapbier”. To give the beer a truly South African, only local hops from the lush Outeniqua Valley in the Cape are used. Kettle hops are restrained for a soft bitterness using Southern Brewer hops. For flavour and a flowery aroma I use a new breed of hops with distant Yugoslavian origins called Southern Promise. There is an estate with a beautiful building called Berghof in Northern Germany, probably a half kilometre from the Danish border in the province Schleswig/Holstein. During the war it was used to station the armoured division of the S.S. It was also an agricultural college and after that changed into an old age home. For a while it was used as a customs post for the border police. Sadly it is currently used to house asylum seekers. Another, Berghof is the infamous hide-out high in the Alps which was the home of Hitler. My own invention of the name Berghof has got nothing to do with either of the above. I saw a beautiful picture of a landscape high in the Alps (Berg) with an onion domed church and a brewer tapping fresh water in a courtyard (hof) and I immediately knew then that this is a logo for one of my beers. I spent hours on the design and eventually had it computerised into graphic form to make it my own. I wanted the logo to bring back fond memories of Germany for those who lived in Germany or those who travelled the upper Bavaria area. I also wanted those who have never been to Germany to associate the Berghof logo with great German beer and the German beer culture. I also liked the coincidence of the same spelling in Afrikaans, German, Belgian and English. During a bout of inspiration I came up with the symbolism (for me) of the various pictures in the logo. The onion domed church is symbolic of the monasteries as the origin of almost all beers, where beer was and still is brewed with patience, in silence and consumed with respect. The monks viewed beer, as I do today, as an honest, wholesome food from the earth, fermented to full flavour, sparkle and maturity by the miracle interaction with Gods nature. The snow covered Alps is symbolic of the mountains as the giver, the provider of water in abundance, released only in its own time by the ancient rhythms of the seasons – not induced by mankind. When the ice melts it releases water which trickles down the slopes and fills the underground caves. The water fountain picture is symbolic of the pure, fresh water which I as brewer is dependant on to brew good beer and the availability thereof for which I am greatly thankful for. The man collecting water at the water fountain is symbolic of the brewer who gives most of his life to toil with natures most precious gifts: fire, water, malt, hops and yeast to bring to society a drink called beer, brewed on earth but made in heaven! There is also a deeper symbolism to the name, Berghof. Money is neutral. You can take the same paper notes to buy drugs or to do well and buy a Bible. It is not the money that is evil in itself. So it is with a name as well. The name Berghof for many has a bad connotation, being the name of the home of Hitler. 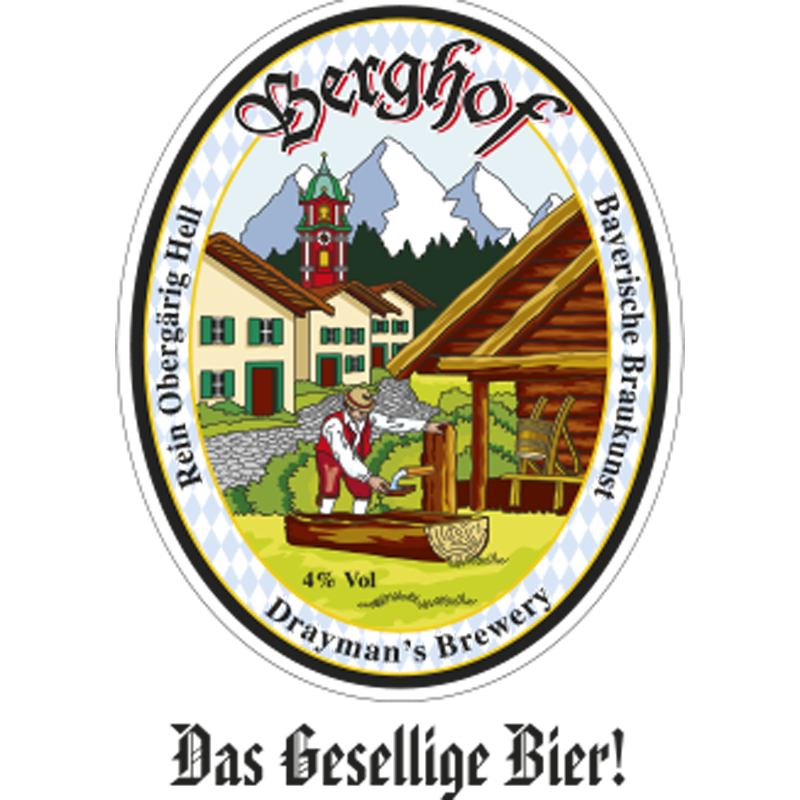 I would like to prove in this day that the evil associated with the name Berghof could be overridden with something as humble, honest and good as the beer that I brew with passion and pride: Berghof! I have been drinking beer for the past 15 yrs it is the best so far.